Wyoming’s Josh Adams and Jason McManamen have earned All-Mountain West honors in a vote of the league’s head coaches, the conference office announced Tuesday. Adams was named to the All-MW First Team, while McManamen was Honorable Mention. Adams, a senior guard, was also voted to the MW media’s first team last Sunday and received their player of the year as well. The conference’s coaches also found him impressive enough to put a Cowboy on their first team for a third-straight season. Adams has averaged 24.9 points per game this season to lead to the league and rank third in the NCAA. He has nine game with 30-or-more points and 21 with more than 20. His 722 points this season broke Wyoming’s single-season record of 701 by Flynn Robinson in 1964-65. 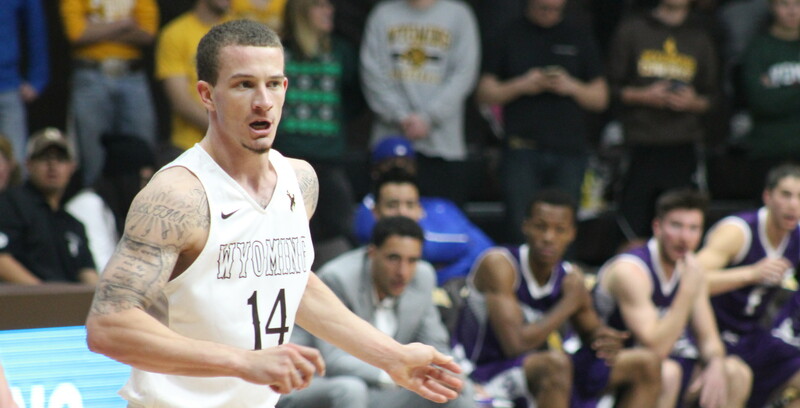 Adams has connected on 94 threes this season, good for second in Cowboy single-season history, which includes a school-record nine in Wyoming’s win at Colorado State on Feb. 20. It wasn’t just scoring for Adams this season, though. He also paces the Pokes in rebounds at 5.6 per contest, assists at 4.2 and steals at 1.5, while ranking in the top 10 of 11 different MW statistical categories. Adams was named preseason All-MW this season after earning All-MW Third Team and MW Championships MVP last season. McManamen, a junior guard, received honorable mention from the media as well. He contributes 14.1 points per game for 10th in the MW and is one of the top three-point shooters in the nation. His team-high 45 percent beyond the arc ranks first in the MW and 10th in the NCAA, while his 3.0 threes per game are second and 25th, respectively. Head coach Larry Shyatt has coached eight different Cowboys to 16 all-conference honors during his six seasons at Wyoming, including two MW Defensive Players of the Year. Eighth-seeded Wyoming opens play at the 2016 MW Championships in Las Vegas against ninth-seeded Utah State on Wednesday at 12 p.m. MT in the Thomas & Mack Center.